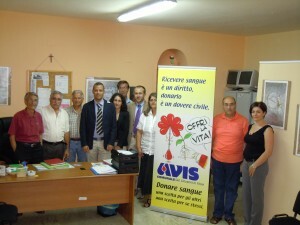 LA BANCA DI CREDITO COOPERATIVO “MEDIOCRATI” HA FATTO DONO ALL’AVIS DI SAN GIOVANNI IN FIORE, TRAMITE IL COMITATO LOCALE DELLA BANCA DI UNO STRUMENTO UTILE PER IL PRELIEVO DEL SANGUE DEI DONATORI. SI TRATTA DI UN FOTOMETRO PORTATILE IN GRADO DI CONTROLLARE RAPIDAMENTE L’EMOGLOBINA NEL SANGUE. NELLA FOTO UN MOMENTO DELLA CERIMONIA CHE VEDE PRESENTE IL DIRETTIVO DELL’AVIS AL COMPLETO CON IL PRESIDENTE ALFONSO LORENZANO E I MEMBRI DEL COMITATO LOCALE DELLA BANCA (SAVERIO BASILE E MICHELE ASTORINO), UNITAMENTE AL DIRETTORE DELLA FILIALE SANGIOVANNESE ANGELO MUTO E AI FUNZIONARI DELLA BCC MEDIOCRATI.